The Ontario Science Centre (French: Centre des sciences de l'Ontario) is a science museum in Toronto, Ontario, Canada, near the Don Valley Parkway about 11 kilometres (6.8 mi) northeast of downtown on Don Mills Road just south of Eglinton Avenue East in the former city of North York. It is built down the side of a wooded ravine formed by one branch of the Don River located in Flemingdon Park. Planning for the Science Centre started in 1961 during Toronto's massive expansion of the late 1950s and 1960s. In 1964, Toronto architect Raymond Moriyama was hired to design the site. The Brutalist design, which consists of three main buildings connected by a series of bridges and escalators, follows the natural contours of the Don River ravine, into which the Centre descends. Construction started in 1966 with plans to make it a part of the city's 1967 Canadian Centennial celebrations. It was first officially named the "Centennial Centre of Science and Technology". However construction was not complete in 1967, and the Science Centre did not open to the public until two years later, on September 26, 1969. At the time, the Science Centre was a pioneer for its hands-on approach to science, along with San Francisco's Exploratorium and Detroit's Museum of Science and Technology. Unlike a traditional museum, where exhibits are for viewing only, the majority of the exhibits at the Science Centre were interactive, while many others were live demonstrations (e.g. metalworking). The Communications room contained a number of computerized displays, including a very popular tic-tac-toe game, run on a PDP-11 minicomputer. In 2001 the Centre embarked on a capital project called "Agents of Change", which focused on innovation and renewed about 85 per cent of the Centre’s public space, including the creation of seven new experience areas. The Centre received $47.5 million in contributions from the government of Ontario, private sector companies and individuals. The Agents of Change transformation was completed 2007, culminating with the opening of the Weston Family Innovation Centre and the Teluscape plaza. The Centre has several hundred interactive and passive exhibits, featuring geology, the science of nature (in the west wing), astronomical science, how to play music and technology in the south wing, human anatomy, communication and bias, and some miscellaneous artifacts of science. Opened in 1996, the IMAX Dome the only theatre of its kind in Ontario. In 1982, the exhibition China: 7,000 Years of Discovery broke all attendance records and attracted more than 1.5 million visitors. The Centre's Rainforest exhibit opened in 1993 and Ontario's only IMAX Dome theatre opened in 1996. Tourism Toronto named the Ontario Science Centre the "fastest growing attraction" in the Greater Toronto Area in 1997. In 2003, the Strange Matter exhibition opened, and KidSpark, a designated space for children eight and under to explore and learn through play, launched. Body Worlds 2 attracted almost half a million visitors over five months when it came to the Centre in 2005. The Space Hall, which features Toronto's only operating planetarium since the closing of the McLaughlin Planetarium, was refurbished in the late 2000s and features one of the few Mars and moon rocks on public display in Canada. The exhibition Facing Mars ran in 2008. The Science Centre features one of the few moon rocks on public display in Canada. The original human anatomy gallery was replaced by the new permanent exhibition, The Human Edge, opened in December 2013 with sponsorship from AstraZeneca. In addition to detailing anatomy, the exhibit explores the possibilities of the human body with activities to simulate the experiences of adventure-seekers, elite athletes and extreme-sports enthusiasts. There are more than 80 exhibits in the hall, which were all developed and built by the Science Centre's staff with input from more than 120 neuroscience, physiology, bio-mechanics and sports medicine experts. In June 2014, the Centre welcomed The Science of Rock 'N' Roll, which explores how advances in science and technology have revolutionized music. The exhibition features eight areas that comprise different interactive components, historical artifacts, informational walls, documentary videos and more. During summer 2015, the Centre hosted the MythBusters: The Explosive Exhibition, based on the popular television series MythBusters. The Ontario Science Centre also has a rolling ball machine built by George Rhoads in the KidsSpark exhibit. In 2017, to celebrate the 150th anniversary of Canada, the Centre opened the exhibition "Canada 150: Discovery Way" featuring Canadian stories behind transformational inventions and innovations. A place of inspiration and expression, the "!dea Gallery"  displays innovative projects by young artists and researchers that blur traditional boundaries between art, science, design and technology. In Knowledge We Trust, ran October 4 to December 7, 2014, and explored the role trust plays in making us willing to share or use the knowledge we receive. The Great Hall is home to Cloud, a massive, computer-controlled kinetic sculpture by Toronto installation artist David Rokeby, which consists of an array of blue and transparent squares that rotate in various ways to simulate the three states of matter: solid, liquid and gas. The Weston Family Innovation Centre houses Pipe Dreams by Bruce Shapiro, a bubble art installation. Lotic Meander by Stacey Levy is an outdoor installation in polished and blasted granite and cast glass set into the solar terrace of the Ontario Science Centre. The work depicts the patterns of water as it moves through a stream bed. For most of the time since opening since 1969, the Science Centre has hosted a demonstration amateur radio station. Formerly located in the Hall of Space, the station is now located on Level 4 of the Centre, next to the elevator. The station has the call sign VE3OSC, and licensed amateur radio operators volunteer there daily from 10 am to 3 pm. As originally built, the Science Centre had a large fountain area directly in front of the entranceway, located to create a traffic roundabout. The original water fountain has been rejuvenated to provide a more welcoming and accessible entrance to the Science Centre. The new plaza, named "Teluscape", was designed by Reich + Petch Architects and EDA Collaborative. It opened to the public on 20 September 2006, and is accessible at all times. The new fountain is also a hydraulophone designed by installation artist Steve Mann. It is a hydraulic-action pipe organ which anyone walking into the space can play . Blocking the flow of any one of the 57 water jets in the fountain forces the water across to a corresponding organ pipe, where it makes a loud sound as the water is forced out through the speaking mouth of the pipe. The lowest 12 notes in each pipe division of the organ are visible as pipes arranged in a circle. The North Division consists of stopped hydrapaisons (similar to diapaisons but running on water rather than air), whereas the South Division pipes are open at both ends (sound emerges from the ends rather than from a mouth as with the North pipes). The North organ console consists of 12 water jets, whereas the south console consists of 45 water jets. The organ is supplied with water from three Pentair pumps, supplying water at a rate of 130 US gallons per minute (8.2 l/s), each by way of a 3 inches (7.6 cm) diameter water line, as well as air from three Ingersol Rand four-cylinder air compressors, each having a 25 horsepower (19 kW) motor. Since the instrument runs on both air and water, it may be regarded as a hybrid hydraulophone and pneumatophone, but because it is played by blocking water jets rather than air holes, it is principally a hydraulophone. The fountain must be shut down and drained to avoid freezing damage during the cold season. On 21 November 2007, the aquatic play facility was temporarily switched from water operation to air operation, effectively becoming perhaps one of the first pneumatic-play facilities, where visitors can frolic in a fountain of air jets. In this mode of operation, the fountain becomes a wind instrument. The hydraulophone may not be operational during the winter months. The Ontario Science Centre Science School (OSCSS) offers grade 12 University Preparation courses in STEM subjects: physics, biology, chemistry, calculus, and advanced functions. All students also complete an interdisciplinary studies credit in science communication while enrolled with the OSCSS. The credits are issued by either the Toronto District School Board or the Toronto Catholic District School Board, which also fund the program so it is available at no cost to students from anywhere in Ontario. While at the Science Centre, students earn practicum hours through volunteering and interacting with visitors. In 1990, it was revealed the Ontario Science Centre had signed a contract with Oman to design a children's museum. The Ontario Science Centre had agreed to boycott Israeli goods and services while under contract. The Ontario Science Centre later amended the contract to specify that all goods sold to Oman would be produced in North America. The centre's Director General Mark Abbott was later fired for knowingly signing the original contract. The OSC is affiliated with the Canadian Museums Association (CMA), Canadian Heritage Information Network (CHIN), and Virtual Museum of Canada. The OSC is a member of the international Association of Science-Technology Centers (ASTC). ^ "Moriyama & Teshima". Mtarch.com. Retrieved 2013-10-02. ^ "40 Years of Innovation". Ontario Science Centre. Archived from the original on April 12, 2010. Retrieved 2010-08-18. ^ "Crossing Boundaries 2010/2011" (PDF). Ontario Science Centre. Retrieved 2014-05-31. ^ "Harry Potter™: The Exhibition to cast a spell on the Ontario Science Centre". Ontario Science Centre. Archived from the original on October 28, 2014. Retrieved 2014-05-31. ^ "Ontario Science Centre Hosts World's Biggest Video Game Celebration with Canadian Premiere of GAME ON 2.0". Ontario Science Centre. Retrieved 2014-05-31. ^ Sanderson, Neil. 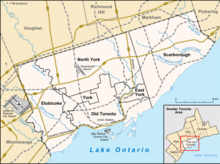 "Amateur radio station VE3OSC Toronto". Retrieved 20 January 2017. ^ "Ontario Science Centre: Volunteer Demos". 2017-01-19. Retrieved 2017-01-19. ^ "VE3OSC - Callsign Lookup by QRZ.COM". 2017-01-19. Retrieved 2017-01-19. ^ "Ontario Science Centre: Science School". Ontariosciencecentre.ca. Retrieved 2013-10-02. ^ Eggertson, Laura (15 November 1990). "Science Centre's Oman contract boycotted Israel". Kitchener - Waterloo Record. ^ "Cohon rejects blame for science centre deal". Toronto Star. 21 November 1990. ^ Brennan, Pat (20 November 1990). "The Ontario Science Centre's fired director-general says he should have been sacked in July if a controversial contract he signed was wrong". Toronto Star. Wikimedia Commons has media related to Ontario Science Centre.